UPPDATED 8:17 AM EST-- SEE BOTTOM -- Six F-16Is of the Israel Air Force's 107th Squadron, each one carrying four Delilah cruise missiles, have left Hatzerim Air Base and headed toward Lebanon. They are waiting for intel to see if two planes heading for Damascus are weapons or not, to destroy them after unloaded. Also, a G-V Nachshon Shavit airborne Signals Intelligence (SIGINT) with serial number 676 is now airborne assisting the other Shavit of Israel Air Force in monitoring radio communications of IRGC Quds Force in Syria. Late last week, Iran wondered aloud if Russia had been deliberately turning OFF the new Syrian S-300 air defense system, to allow Israel to attack Iranian forces inside Syria. Perhaps today, we will see. . . This is a fast-developing story, please check back for updates. Reports indicate a Drone Attack has been repelled by Syrian air defenses. NOTE: All day Saturday, a total of TWO (2) donations came in to help pay the costs of this web site and radio show for February. That's TWO donations, despite over twelve THOUSAND of you who read articles here. I thought you should know how many take, and how few donate. Without your immediate financial help, I am not certain this endeavor will be able to continue in February because I have five days to raise about $1900. If you enjoy this news story, and the cutting-edge reporting on this web site, I implore you to please make a donation using the button below, to SUBSCRIBE for $1 a week, billed quarterly ($13) HERE, or $5 a month HERE. It costs money to bring you the news. I cannot do this without your help. Please help right now. AGAIN for the 2nd time IAF Israeli Air Force 4X984 Gulfstream G550 Nachshon Eitam GLF5 IAI EL/W-2085, (AEWC) multi-band radar system Tail:537 Icao: #738A4C, providing intelligence - now airnborne heading toward Syria coast. 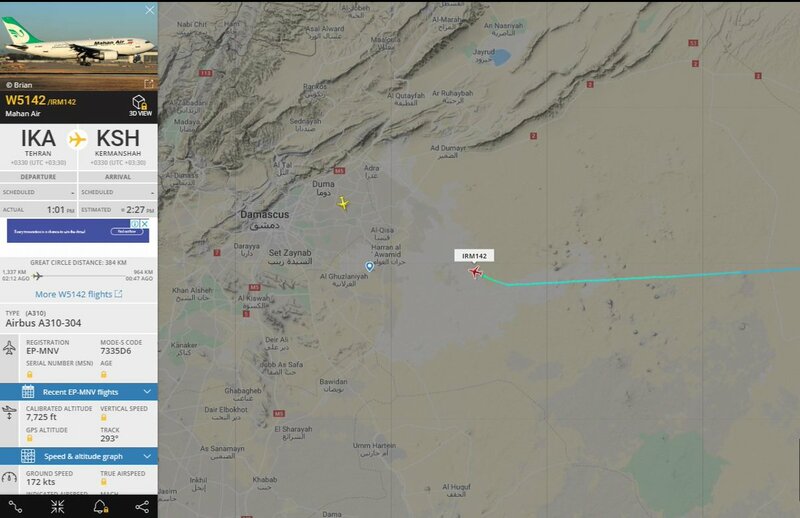 After landing in Tehran from Moscow yesterday, Iran's Cargo Pouya Air IL76TD EP-PUS from Tehran to Damascus is the first Iranian cargo flight since the last Israeli attack. Reports of sonic booms all over Israel, likely caused by Israeli jets breaking the sound barrier. Russian air defenses shot down three armed drones in the Jableh countryside this afternoon. As I have said before , these INSIPID children of the snake charming cult need a good old fashion nuking. There are weekly gay/lesbian/beastiality parades in the tel ashit and jerusashit ghettos. American taxpayers would get more bang for the hard earned money these filthy degenerates rob us of through by their communist Fed Reserve and IRS ponzie schemes, if the nuking was timed for these parades and the slithering snakes are gathered together in their den they call a knesset, it would bring terrorism to an end and joy, peace, and good will across the world. MAJOR PROPHECY UPDATE! DAMASCUS DESTRUCTION ARTICLE! Just a few moments ago, I have finished updating this article with some explosive prophetic information regarding newly emerging signs. With the continuously escalating situation in Damascus, Syria, this one is a MUST SEE! Some here may have already read this article as I have posted this before, so one can skip down toward the end and read the "ARTICLE UPDATE" section highlighted in red for the update. Link below. The Jews are waiting for some Civilian planes full of women and children to HIDE BEHIND. IDF --- the LEAST moral army on earth. Drones are much cheaper than F-16’s for the first couple of rounds until you figure out where the SAMS are. Only 42 bombing days before Israeli elections. Or maybe less if Netanyahu gets charged with fraud, bribery, corruption. April 10th 2019 is 490 days after Trump recognized Jerusalem as Israels capital. April 10th 2019 will be 1290 days after the last blood moon of 2015. December 25th 2018 was 490 days after the great solar eclipse over America. That was on December 14th 2018 then this. Netanyahus coalition collapses: Israel heading to elections on April 9th 2019. These are the signs in the heavens that Jesus talked about to watch for leading up to and going into the Tribulation period. We are there. Lift up your heads for your redemption draweth nigh! The time frame of this word of knowledge has been documented before the event and decision of a country that is the pivot point to fulfilling end times events and can be confirmed.